On behalf of the Division of Student Affairs, I want to share that we are glad that you are here (or considering being here). 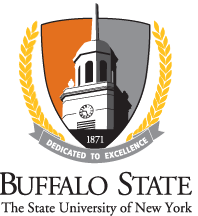 As one of the many areas at Buffalo State College, Student Affairs shares in the campus’s commitment to supporting students and their learning experiences. We do this work in collaboration with our faculty and staff colleagues around the campus to enrich learning through a host of programs and services. We encourage every student to be the best Bengal they can be! This includes embracing the diversity of the campus and beyond. Being an inclusive community calls upon each of us to be willing to share our experiences, learn from others, and find ways to provide support and intervention to fellow community members. In every corner of the campus, Buffalo State students have opportunities to grow and learn, whether it’s over a cup of coffee, hanging out in the union, attending a lecture or cultural event, or attending a Bengal athletic game. In addition to supporting students on the campus, we also encourage engagement with all that the Buffalo community has to offer. Our students can enrich their learning and impact lives through the myriad of volunteer, career, and cultural opportunities that the city has to offer. I encourage you to continue to become familiar with the range of experiences available to students on and around campus. I look forward to seeing you around campus and hearing from you on social media or via email.